The Taxable account generated $1,555.20 of dividends in 2019 compared with $1,237.36 of dividends in 2018. February's income was boosted by additional capital added to the Taxable account and includes a handful of companies that paid an increased dividend. We made major changes to the Fixed Income portion of the portfolio by switching to short-term CDs vs. Schwab Value Advantage Money Fund. Average monthly income for the year is estimated to be $1,113.75 for 2019 compared with an average of $995.85 in 2018. So far, my new format has been well-received and I appreciate those who have contributed constructive feedback. 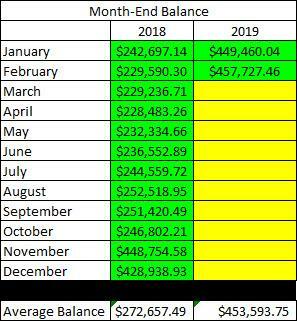 I recently decided to add another chart and table that gives insight into the value of the Taxable account on the last day of each month. I believe that the addition of this should help readers' better understand the changes that take place in the account and also how additional funds have increased the dividend payments (the current payments represent a mix between dividend increases and investing additional capital because I do not automatically reinvest dividends). I like to start by taking account of any significant events that may have impacted the value of John and Jane's portfolio during the month of February. On the news front, there were few events that were actually worth noting in the month of February that had any sort of impact on our investment goals or strategy. If anything, the biggest story is the deteriorating situation in Venezuela but this has very little impact on the economy because they are already so far removed from any normal trade activities. The US economy is a mixed bag at this point in time as we only added 20,000 jobs in February which was well below the expected gain of 180,000 jobs but it is important to remember that this follows a blowout January where the economy added 304,000 new jobs. The slight uptick in wages has contributed to a small increase in consumer prices during the month of February. The Federal Reserve Chairman Jerome Powell has made clear that the Fed has turned more dovish as the US central bank adopts a "wait-and-see approach" in regard to monetary policy. Analysts currently estimate that we will see additional rate hikes in 2019 compared with the four rate hikes experienced in 2018. In my opinion, I credit the dovish Fed as the main catalyst for real estate investment trusts (REITs) strong performance. These companies rely on debt for their growth and a more dovish policy allows them to take advantage of lower interest rates for a longer period of time. All of these factors have led to relatively stable prices in February and the only expected catalyst is a finalization of the trade agreement with China. John and Jane are two real people who asked me to help manage their retirement portfolios. It is important to understand that I am not a financial advisor and merely provide guidance for my clients' account based on a friendship that goes back several years. I call them my clients' for simplicity sake, but I do not charge them for what I do. The only request I made to them was that they allow me to anonymously write about them so that I can potentially help others who are wanting to achieve the same thing. John and Jane have adopted my philosophy of focusing on cash flow from investments instead of drawing out large sums of money by selling shares of currently held investments. In a nutshell, what John and Jane want is a portfolio of stocks that will provide a steady stream of growing dividend income that will supplement their income during retirement. Although it will be necessary for John and Jane to sell shares from their Traditional IRA, the goal of the Taxable and Roth IRA is that they will never need to sell any shares (unless they want to) because the income generated will prevent them from needing to sell shares as a means of "funding their retirement." 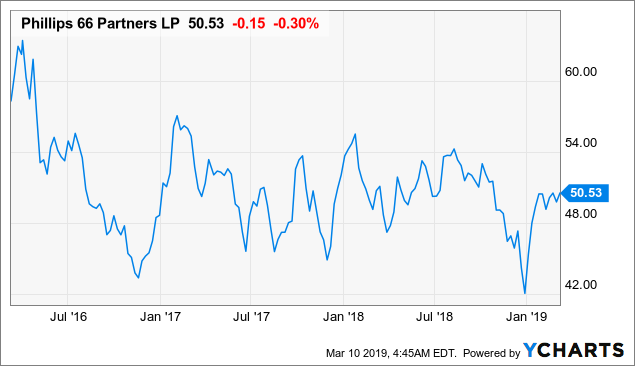 In the past year, I have typically focused on stocks that paid a qualified dividend because they qualify for the lower long-term capital gains tax rate vs. ordinary dividends which are taxed as ordinary income. This has become less important now that 2018 was John's first year of retirement. Changes in the tax brackets also support this approach because the ranges have been expanded and include basically all of their income in the 22% bracket. I have chosen to separate the fixed income figures from the rest of the portfolio in order to avoid confusion which allows those reading to gain a better understanding of how John and Jane's Taxable Portfolio is generating interest and dividend income. Certificates of deposit (CDs) are the primary recipient of these funds because we are looking for zero volatility and FDIC insured product. Typically I invest only in short-term CDs (1 to 3 months) because the increase 20 bps in yield isn't enough to justify a year-long CD in my mind. It should also be noted that a number of companies where we live are offering better CD specials than what can be found on Charles Schwab (SCHW) (at the moment). 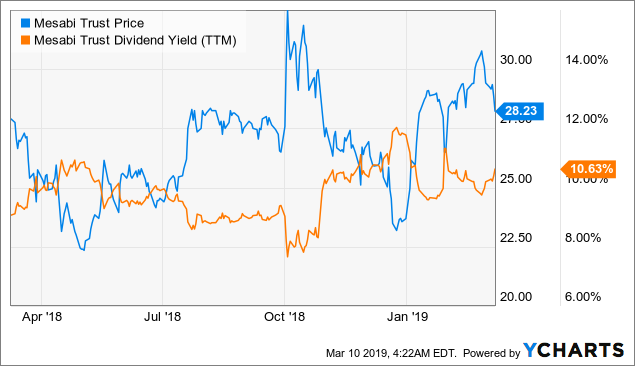 We recently shifted everything from the Schwab Value Advantage Money Fund (SWVXX) because their slightly higher yield does not justify the higher fees associated with the account (thanks to the reader who brought this to my attention). Although I liked the next-day access to these funds, there hasn't been much of a reason for the need of the additional capital because nearly everything looks overvalued. Due to the short-term nature of these funds, I will not be projecting future income because there is too much volatility to get a reasonable grasp of what CD mix and rates will do at the time these expire. Green - Dividend received confirmed (actual dollar amount). Red - Security has been sold or has expired and no longer exists. In total, interest from fixed income provided John and Jane with an additional $295.07 in the month of February. EPR Properties - EPR has been producing some great results and the improvement in their stock price reflects it. 2018 guidance moves to $5.30-5.50/share which gives the stock a payout ratio between 82% and 85%. 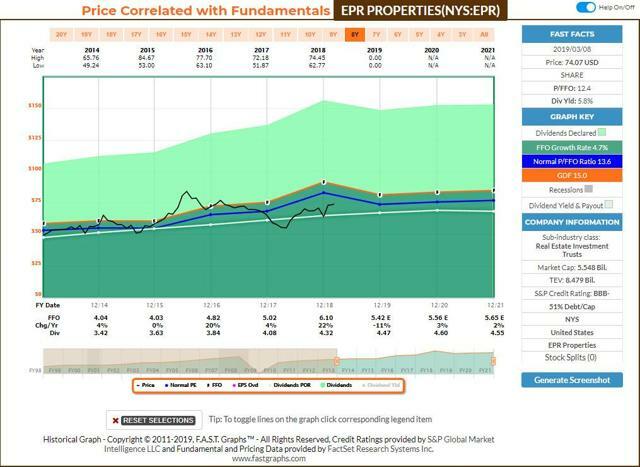 EPR operates in such a unique REIT segment that we feel confident in its ability to generate consistent funds from operations (especially as its book of business diversifies away from movie theaters). EPR's dividend was increased from $.36/share per month to $.375/share per month. This represents an increase of 4% and a new full-year payout of $4.50/share compared with the previous $4.32/share. This results in a current yield of 6.08% based on a share price of $74.07. Mesabi Trust - MSB is unique in the sense that it is the only variable dividend-paying stock in John and Jane's Taxable portfolio. Because the dividend is based on the volume of iron ore shipped from the Peter Mitchell iron mine, I believe it is most appropriate to compare the quarterly dividend to get a better idea of how the dividend has grown year-over-year. February 2018 saw the quarterly dividend increase to $1.18/share which was up from $.14/share in 2017. 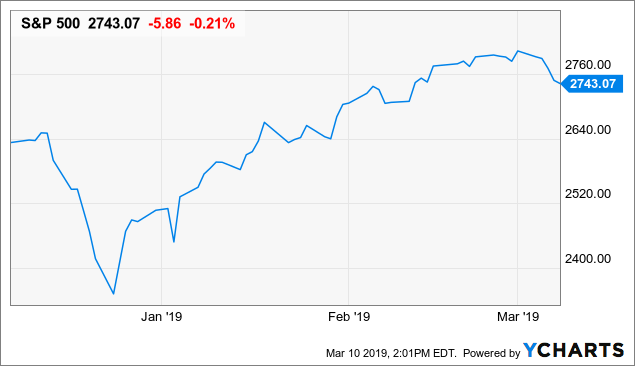 Over the course of the last year, MSB has continued to see strong volumes which propelled the dividend in February 2019 to $1.39/share (which is the highest quarterly payment amount I could find going back all the way to 1990). Using the FY-2018 dividend payments, MSB's stock is currently offering a yield of 9.88%. MSB's dividend was increased from $1.18/share in Q1-2018 to $1.39/share in Q1-2019. This represents an increase of 17.8% on a year-over-year basis. This results in a current yield of 9.88% when we use FY-2018 dividend payments and a share price of $28.23. 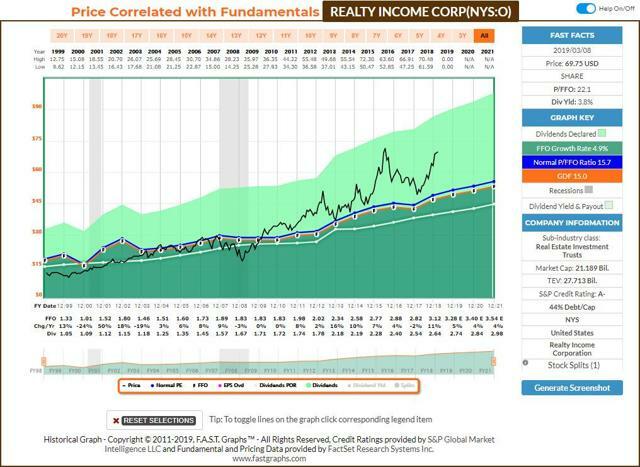 Realty Income - It never gets old covering this dividend dynamo as the regular quarterly increases and one annual (this one) are always welcome. While Realty Income isn't offering much for an increase, the stock price has made it a good candidate to sell and take some gains (which is exactly what we did in the retirement accounts for John and Jane). The current Price/Funds From Operation (P/FFO) is 22.1x compared with a historical average of 15.7x. 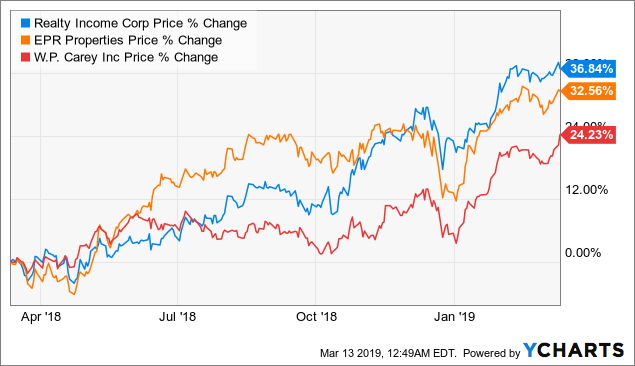 Regardless of its overvalued situation, the portfolio is strong and occupancy in 2018 was 98.6% and 2019 AFFO is expected to fall within the range of $3.25-3.31/share for a payout ratio of roughly 83.4%. O's dividend was increased from $.2210/share per month to $.2255/share per month. This represents an increase of 2% and a new full-year payout of $2.71/share compared with the previous $2.652/share. This results in a current yield of 3.88% based on a share price of $69.75. 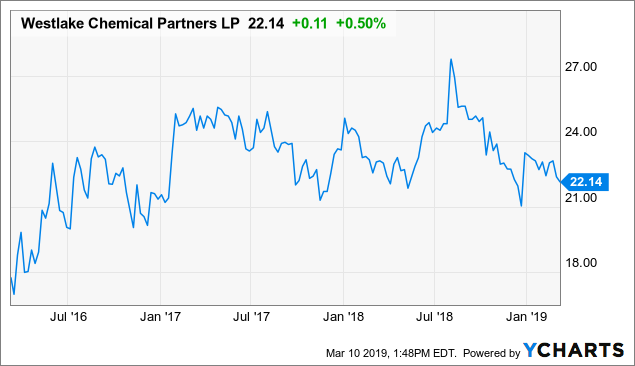 Phillips 66 Partners - When Transmontaigne Partners (TLP) announced that it was going to be bought out by ArcLight Energy for $41/share, we took the offer and never looked back. While we saw a true long-term value story for TLP, we accepted reality and bought shares of PSXP which came with a lower dividend yield but also offered a stronger dividend growth story as it has raised the dividend by at least 5% since November 2017. Fortunately, we were to purchase shares at a time when the price was being impacted by an erratic December market. We plan to add to this position if shares drop below $47/share. PSXP's dividend was increased from $.792/share per quarter to $.835/share per quarter. This represents an increase of 5.4% and a new full-year payout of $3.34/share compared with the previous $3.168/share. On an annualized basis, PSXP has increased its quarterly dividend from $.678/share to $.835/share for a total distribution growth of 23.1% YoY. This results in a current yield of 6.61% based on a share price of $50.53. 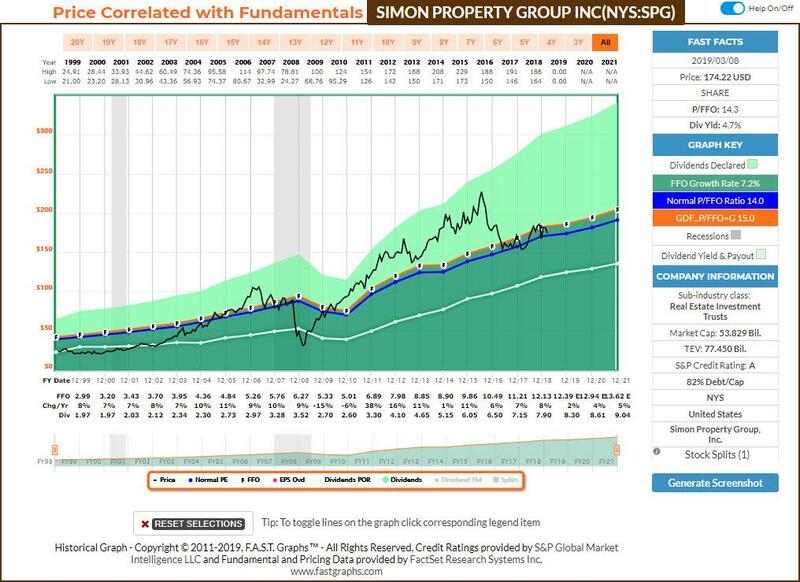 Simon Properties - I recently wrote an article about SPG after visiting one of its outlet centers in Phoenix, Arizona. Everything about that experience in addition to the financials impressed me to the point where we finally added to the SPG position. Given SPG's growth plans internationally, I believe that the stock is fairly valued and represents a compelling investment for investors looking for quality. See my article Simon Property Group: The Blue Chip REIT To Own For DGIs for more insight. SPG's dividend was increased from $2.00/share per quarter to $2.05/share per quarter. This represents an increase of 2.5% and a new full-year payout of $8.20/share compared with the previous $8.00/share. On an annualized basis, the dividend in January of 2018 was $1.95/share quarterly or $7.80/share annually compared with $2.05/share quarterly or $8.20 annually and represents an annual increase of 5.12%. This results in a current yield of 4.71% based on a share price of $174.22. Westlake Chemical - The most recent distribution increase marks the 16th consecutive distribution increase and represents a 12% increase over Q4-2017 distribution. Noted in the earnings transcript was the fact that the distribution has increased by 150% since IPO and the distributable cash-flow stands at 1.12x. WLKP offers an extremely safe option in the ethylene industry because their take-or-pay agreement with its parent company Westlake Chemical (WLK) generates a net margin of $.10/lb of ethylene. Investors should note that management expects the IDR reset will allow WLKP to grow its distribution by low-double digits on an annualized basis over the course of the next decade. We will consider adding to this position under $22/share and see strong support at $21/share. WLKP's dividend was increased from $.4207/share per quarter to $.4328/share per quarter. This represents an increase of 2.9% and a new full-year payout of $1.73/share compared with the previous $1.68/share. This results in a current yield of 7.81% based on a share price of $22.14. The Taxable Portfolio in 2018 had 40 different positions and currently includes 42 unique positions as of 3/10/2019. We do not have any plans to add new positions to the portfolio, but it is likely we will increase positions if they reach our price targets. US hiring slowed down and was the lowest we have seen in a year. Chinese exports looked weak and German factory orders came in at less than expected. The trade agreement between the US and China looks promising but also exacerbates these issues until a final agreement is reached. The S&P 500 has recovered nicely since the December sell-off which is why we are exiting select positions in the retirement portfolios and holding cash for the time being. February 2019 saw income increased by 25.7% over the previous year and was partially due to the additional funds invested throughout the year and dividend increases. None of the following images take into consideration the income generated by the Fixed Income holdings. 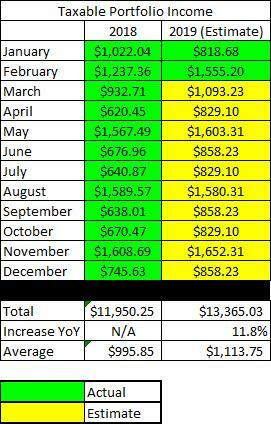 Here is a graphical illustration of the dividends received on a monthly basis. Based on the current knowledge I have regarding dividend payments and share count, the following table is a basic prediction of the income we expect the Taxable Portfolio to generate in 2019 compared with the actual results from 2018. As a new feature going forward I also want to include account balances to help readers' understand how the size of the portfolio has changed over time. By showing when additional funds were added to the account I hope it will help explain certain changes in income, etc. Please note that this includes the Fixed Income holdings in the total account balance. To wrap up February's assessment I always like to include a gain/loss for each position in the Taxable Portfolio because it is important to consider that some positions will be the gain and others at a loss. If you plan to have your own dividend growth portfolio you will need to learn to live with this volatility because even the highest quality portfolio will be subject to some degree value fluctuation. Values are fairly comparable to what they were at the end of January. Total dividend income expected for the year has increased after I updated the income generated in the month of February. At the time I published the January 2019 article (here), the account was positive $7,570.01 compared with a value of $8,316.63 on March 10, 2019. 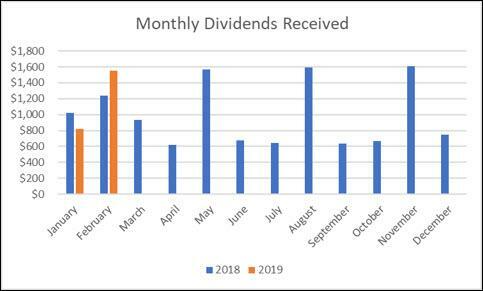 As expected, we have seen a handful of companies increase their dividends in the first two months of 2019 but dividend growth appears to be slowing compared with many of the increases in 2018. When I create a forecast for dividend growth I assume a minimum of 3%, a midpoint of 5%, and an exceeds goal of 7%. Based on the increases seen in 2019 I expect that we will see something closer to the midpoint of 5%. 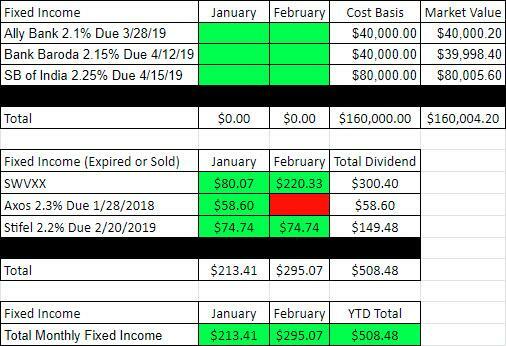 If we include the fixed income holdings in John and Jane's Taxable Portfolio it results in a total income of $1,850.27 in the month of February. What about your dividend growth portfolio? I'd love to hear feedback on potential stocks to consider. Let me know if this new format is making my work more valuable. As always, I appreciate any constructive feedback readers' may have because my ultimate goal is to make my work as helpful as possible for those reading. I'd like to give a shout out to several people (you know who you are!) who have provided excellent insight which has helped me increase my investing knowledge and improved the performance of this portfolio. Thank you! In John and Jane's Taxable account, they are currently long the following mentioned in this article: Apple (AAPL), Arbor Realty (ABR), Archer Daniels Midland (ADM), Air Products & Chemicals (APD), Apple REIT (APLE), BP (BP), Buckeye Partners (BPL), Cardinal Health (CAH), Clorox (CLX), Cummins (CMI), Dover Corporation (DOV), Eaton Vance Floating-Rate Advantage Fund A (EAFAX), Emerson Electric (EMR), EPR Properties (EPR), Energy Transfer (ET), General Mills (GIS), Helmerich & Payne (HP), Hormel (HRL), Iron Mountain (IRM), Johnson Controls (JCI), LTC Properties (LTC), Leggett & Platt (LEG), Macquarie Infrastructure (MIC), Altria (MO), Mesabi Trust (MSB), New Residential (NRZ), Realty Income (O), Old Republic International (ORI), Phillips 66 Partners (PSXP), Ryder Corporation (R), Tanger Factory Outlet Centers (SKT), Schlumberger (SLB), Southern Corp. (SO), Simon Property Group (SPG), AT&T (T), Texas Instruments (TXN), United Technologies (UTX), Verizon (VZ), Washington Trust (WASH), Westlake Chemical (WLKP), W.P. Carey (WPC), and Exxon Mobil (XOM). Disclosure: I am/we are long APLE, GIS, T. I wrote this article myself, and it expresses my own opinions. I am not receiving compensation for it (other than from Seeking Alpha). I have no business relationship with any company whose stock is mentioned in this article.